If you haven't already seen, I recently relocated from a West End studio to a much larger, Crosstown/Gastown loft. This rustic yet modern space is quite big, at over 1,000 square feet for two, and features large bay windows, wide-panel oak floors, a roaring, open gas fireplace and plenty of room for play – and work. While typically I'd work from a nearby co-working space, I've taken to working from home much more lately, but in order to so adequately, I had to pay some keen attention to lighting first. Let there be light! Here are my tips for lighting your home, or alternatively, lighting your life with SYLVANIA Canada bulbs. Choose the right bulbs for your preferred temperature, and no I don't mean hot or cold – but rather, warm or cool when it comes to the appearance of the light emitted by your bulbs. This might seem like a trivial matter but it isn't. Especially because I work from home, I find light that is too cold in temperature to be a little irritating to my rather sensitive eyes. I wanted an energy-efficient LED bulb with a warm hue, unlike what you usually find in a corporate office space, which is the exact opposite of what I wanted to create in my home office. I recommend SYLVANIA ULTRA LED Filament which last 15x longer than incandescent bulbs and offer a warm, uplifting atmosphere. Add a standing lamp or two to your living space. There's never enough lighting, like never, so be sure to add one (or in my case, two) standing lamps to your living space. 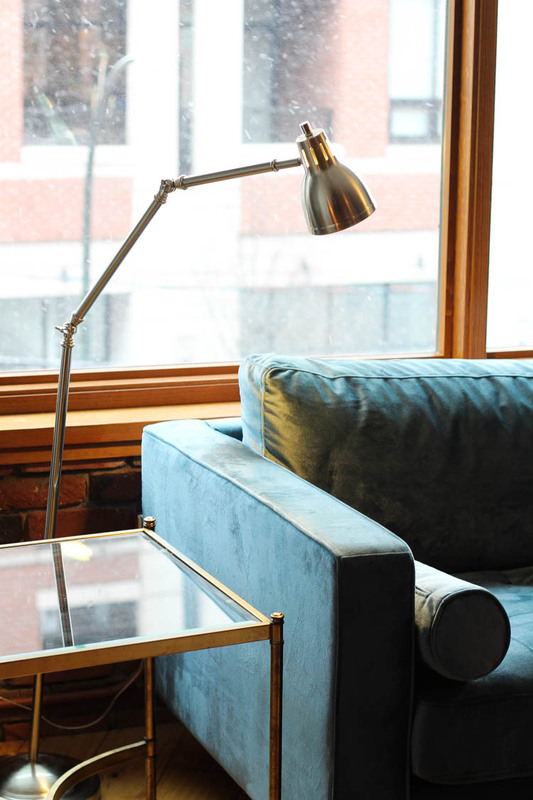 I'd recommend an arch over-hang type lamp for your living space, especially if you have a sectional, as these types of floor lamps not only provide ample and correctly directed light, they also add an attractive design feature to your space. This turns your otherwise dimly-lit space into one that you can use for all sorts of things: socializing, relaxing, working, reading – you name it! Add additional lighting to your workspace. I also opted for the same warm LED bulbs in my workspace, and made sure to add an additional lamp to the space to brighten it even more. This way, I find I can turn down the brightness on my laptop and save my eyes some strain. I sometimes opt to use only the dimming light above my desk when I'm working in the evening time, but otherwise, it's all or nothing! Adding some additional light to your home seems to have the same effect on your world – don't let a lack of luminance in your home get you down! Approach the subject of lighting your home sooner than later and you'll be feeling so much brighter. Pun intended. *SYLVANIA ULTRA Filaments are also available on Amazon here.